Three members of The Hawk, Saint Joseph’s student newspaper, received Keystone Press Awards in April 2016, more than the publication has received in any other year. 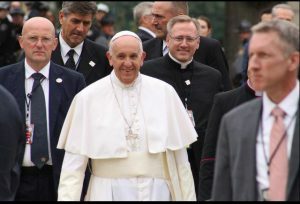 Matt Haubenstein ’15 of The Hawk took this award-winning photo of Pope Francis at SJU. Rev. William G. Donovan, Ph.D. ’81 (right), who served as the liaison of the Archbishop of Philadelphia to the Pontifical Council for the Family, joined the pontiff on campus. Photo editor Matt Haubenstein ’15 (B.A.) received first place for his news photo of Pope Francis on campus during his visit to Philadelphia. Together with fellow staff photographers Shannon Adams ’16 and Joey Toczylowski ’19, he also received the second place award in the Photo Story category for a series of photographs taken during Pope Francis’ drive on City Avenue. Staff writer Vivian Milan ’18 received an honorable mention for Feature Story “Underground Preaching,” which highlighted Down to Pray, the SJU campus Bible study group. The Pennsylvania News Media’s annual Student Keystone Press Awards recognize college and high school journalism that delivers relevance, integrity and initiative to readers.